Surface effects play a major role in shaping optical and electronic properties of quantum dots given their high surface/volume ratio. Yet they remain poorly understood and have not been the object of intense investigation in the academic community. We are currently working on a simple model based on semi-classical electron transfer and a single surface state, which differs from the traditional model that views the surface as a broad distribution of mid-gap defects states. We are testing this model on white light emitting dots synthesized in our lab as well as other commercial samples. Linking surface effects to the debate about multiexcitons and its implications for photo-voltaics, we have also shown that surface-induced charge trapping processes are at the origin of the signals that had been interpreted as the signature of multi-excitons generation by other studies. 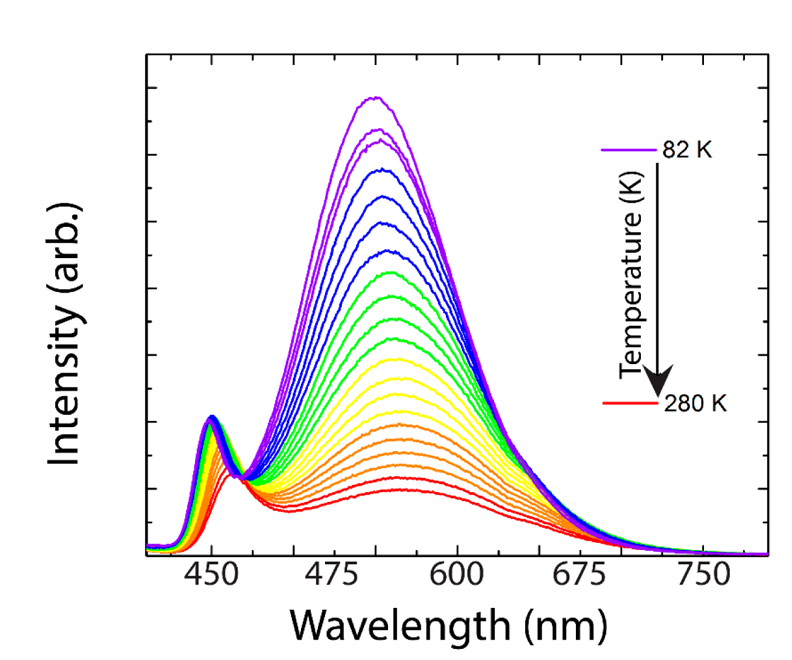 Figure: Temperature depedent photoluminescence in ultrasmall dual-emitting nanocrystals. One of the earliest motivations for development of quantum dots was for optical gain media. 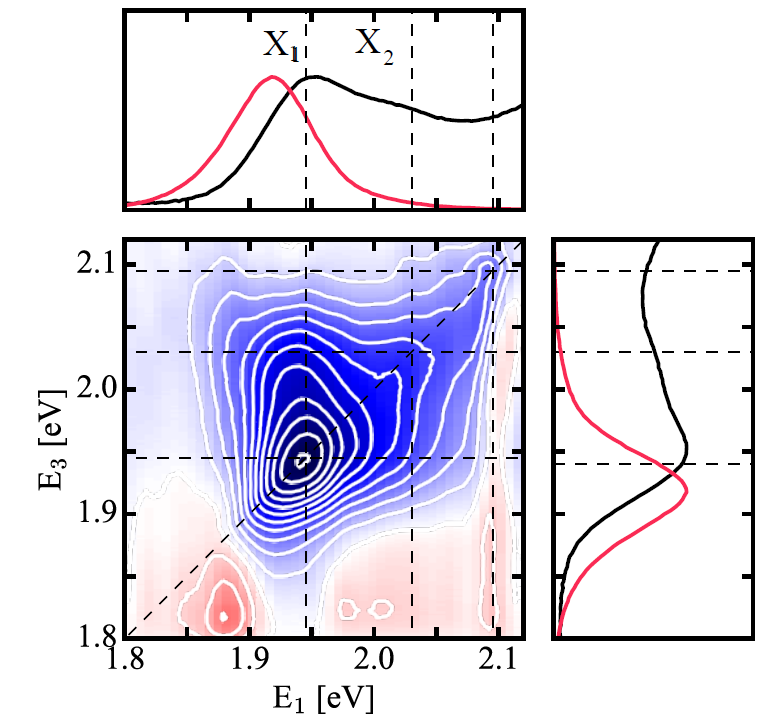 Using a state-resolved pumping scheme, we have demonstrated for the first time that optical gain is dependent upon the initial excitonic state. By prescribing the specific multiexcitonic states which can create, block, and ultimately control optical gain spectra, we have recovered the theoretically predicted size independence, even in systems which previously showed zero gain. Building on our previous results, we have recently gone one step further and provided for the first time the proof of concept that quantum dots can be used as a platform to perform all-optical logic. Figure: Dependence of optical gain in CdSe nanoscrystals on the average exciton population per nanocrystal. Semiconductor nanocrystals emit light from excitons confined to their core, as well as from their surfaces. We have used a streak camera to simultaneously resolve the temporal and spectral dynamics of ultrasmall CdSe nanocrystals that show both core and surface photoluminescence. This reveals the timescale for the electron transfer between the core and the surface. These spectra also reveal electron dynamics in the surface band, which gives rise to a rich average lifetime spectrum. These dynamics are explained by invoking two surface states. This simple model further rationalizes the role of ligands in tuning the surface emission of nanocrystals. These experimental results provide a critical test of our theoretical understanding of the electronic structure of the surface. 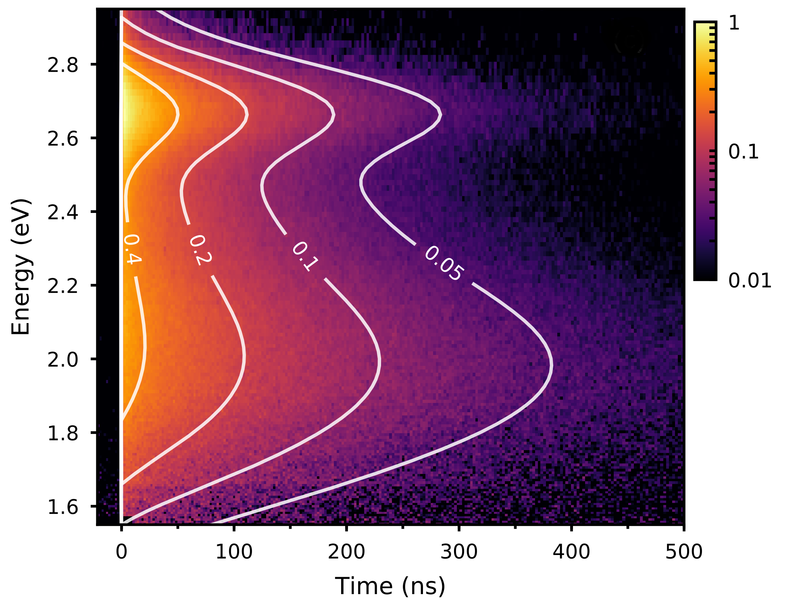 Figure: Time dependent photoluminescence from ultrasmall CdSe nanocrystals shows emission from the core (around 2.7 eV) and from the surface (around 2.0 eV). Ultrafast coherent multi-dimensional spectroscopies are a powerful set of techniques used to unravel complex processes. These processes range from electronic coherences in molecular chromophores to many-body interactions in quantum-confined materials. Yet these spectroscopies remain challenging to implement at the high frequencies of vibrational and electronic transitions, thereby limiting their widespread use. We have demonstrated three signifcant methodological improvements of two-dimensional spectroscopy at optical frequencies, and applied the method on two different systems. The methodological improvements are threefold. First, we introduce a hollow-fibre setup for the production of broadband visible pulses. This source is comparatively simple to operate, and yields stable, 45 µJ pulses over the 520-700 nm region. Second, we demonstrate the feasibility of two-dimensional electronic spectroscopy in a single beam. By appropriately modulating the phases of the pulses within the beam, we show that it is possible to directly read out the relevant optical signals. This work shows that one needs neither complex beam geometries nor complex detection schemes in order to measure 2D spectra at optical frequencies. Finally, we introduce a setup for complete and independent polarization control of each pulse in the sequence. Together, these methodological improvements represent important enabling steps towards the longstanding goal of achieving an "Optical NMR", and extends the realm of all-optical multi-dimensional spectroscopies to spatially resolved experiments. The methods are applied on two classes of systems. The model system Nile Blue has been used to validate the performance of the instrument. The spectrometer wis alsoused to reveal new processes in colloidal semiconductor CdSe nanocrystals, a system of contemporary interest. 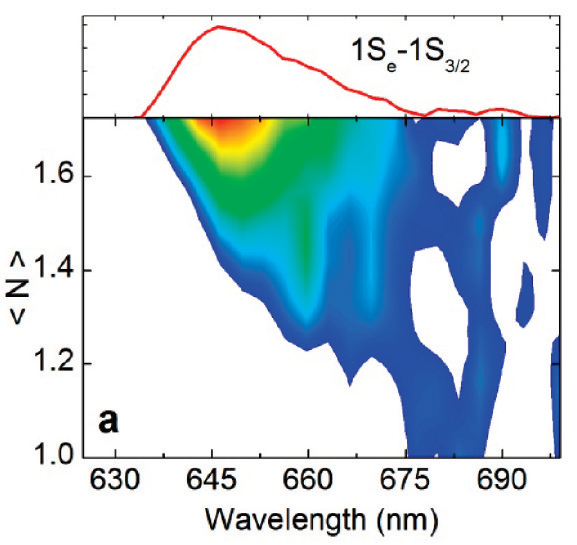 Figure: Example 2D spectrum on colloidal CdSe quantum dots, here at a population time of t2 = 10 fs. The linear absorption (black) and photoluminescence (red) are indicated for reference. Colorscale ranges from -1 (blue) to +1 (red).